Beckwith, Christopher I. (2009): Empires of the Silk Road: A History of Central Eurasia from the Bronze Age to the Present. Princeton: Princeton University Press. আইএসবিএন ৯৭৮-০-৬৯১-১৩৫৮৯-২.
Cooper, Arthur (1973). Li Po and Tu Fu: Poems Selected and Translated with an Introduction and Notes (Penguin Classics, 1973). আইএসবিএন ৯৭৮-০-১৪-০৪৪২৭২-৪. Frankel, Hans H. (1978). The Flowering Plum and the Palace Lady. (New Haven and London: Yale University Press) আইএসবিএন ০-৩০০-০২২৪২-৫. Hinton, David (2008). Classical Chinese Poetry: An Anthology. New York: Farrar, Strauss, and Giroux. আইএসবিএন ০-৩৭৪-১০৫৩৬-৭ / আইএসবিএন ৯৭৮-০-৩৭৪-১০৫৩৬-৫. Hinton, David (1998). The Selected Poems of Li Po (Anvil Press Poetry, 1998). আইএসবিএন ৯৭৮-০-৮৫৬৪৬-২৯১-৭ . Holyoak, K. (translator) (2007). Facing the Moon: Poems of Li Bai and Du Fu. (Durham, NH: Oyster River Press). আইএসবিএন ৯৭৮-১-৮৮২২৯১-০৪-৫. 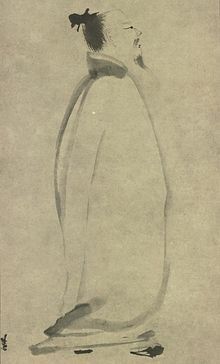 Obata, Shigeyoshi (1923). The Works of Li Po, the Chinese Poet (J. M. Dent & Co,). ASIN B000KL7LXI. Stimson, Hugh M. (1976). Fifty-five T'ang Poems. Far Eastern Publications: Yale University. আইএসবিএন ০-৮৮৭১০-০২৬-০* Seth, V. (translator) (1992). Three Chinese Poets: Translations of Poems by Wang Wei, Li Bai, and Du Fu. (London: Faber & Faber). আইএসবিএন ০-৫৭১-১৬৬৫৩-৯. Weinberger, Eliot. The New Directions Anthology of Classical Chinese Poetry. (New York: New Directions Publishing Corporation, 2004). আইএসবিএন ০-৮১১২-১৬০৫-৫. Introduction, with translations by William Carlos Williams, Ezra Pound, Kenneth Rexroth, Gary Snyder, and David Hinton. 34 Li Bai poems[স্থায়ীভাবে অকার্যকর সংযোগ], in Chinese with English translation by Witter Bynner, from the Three Hundred Tang Poems anthology. 27 Recordings of "Drinking Alone by Moonlight," from the LibriVox website. Retrieved July 1, 2007. The works of Li Po, the Chinese poet, translated by Shigeyoshi Obata Google books version of Obata's 1922 translation.